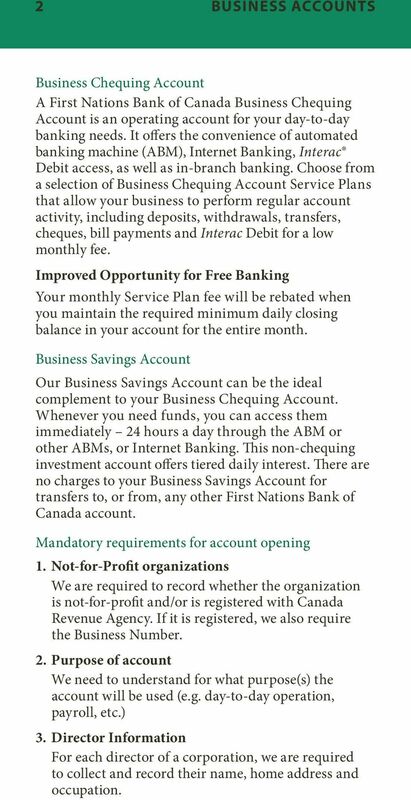 Download "BUSINESS ACCOUNT SERVICE PLANS AND RELATED PRODUCTS"
2 2 BUSINESS ACCOUNTS Business Chequing Account A First Nations Bank of Canada Business Chequing Account is an operating account for your day-to-day banking needs. It offers the convenience of automated banking machine (ABM), Internet Banking, Interac Debit access, as well as in-branch banking. 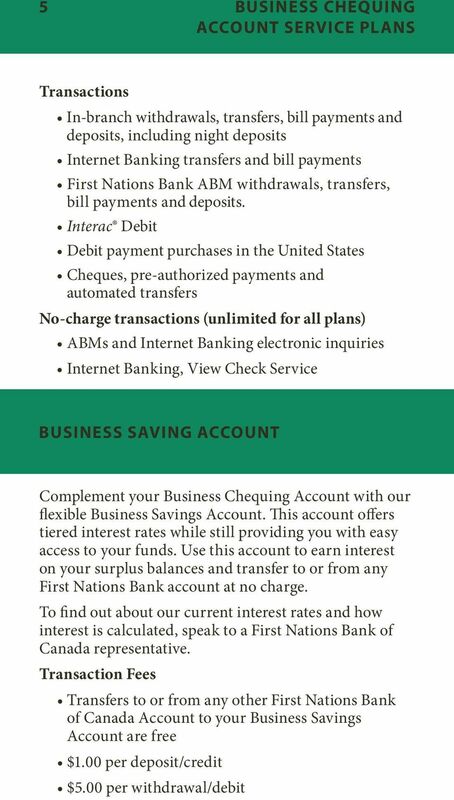 Choose from a selection of Business Chequing Account Service Plans that allow your business to perform regular account activity, including deposits, withdrawals, transfers, cheques, bill payments and Interac Debit for a low monthly fee. Improved Opportunity for Free Banking Your monthly Service Plan fee will be rebated when you maintain the required minimum daily closing balance in your account for the entire month. Business Savings Account Our Business Savings Account can be the ideal complement to your Business Chequing Account. Whenever you need funds, you can access them immediately 24 hours a day through the ABM or other ABMs, or Internet Banking. This non-chequing investment account offers tiered daily interest. 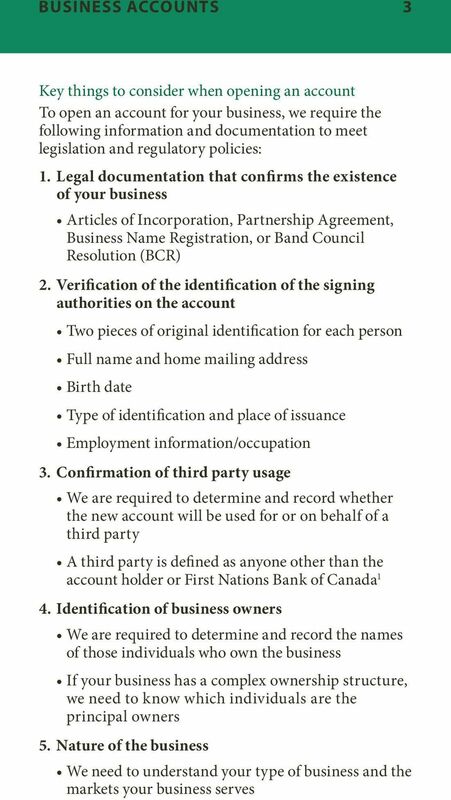 There are no charges to your Business Savings Account for transfers to, or from, any other First Nations Bank of Canada account. Mandatory requirements for account opening 1. Not-for-Profit organizations We are required to record whether the organization is not-for-profit and/or is registered with Canada Revenue Agency. If it is registered, we also require the Business Number. 2. Purpose of account We need to understand for what purpose(s) the account will be used (e.g. day-to-day operation, payroll, etc.) 3. Director Information For each director of a corporation, we are required to collect and record their name, home address and occupation. 4 4 BUSINESS CHEQUING ACCOUNT SERVICE PLANS Our Service Plans for Businesses offer convenient banking options and are available in Canadian and U.S. dollars. This comparison chart can help you decide which plan is best suited to meet your needs. 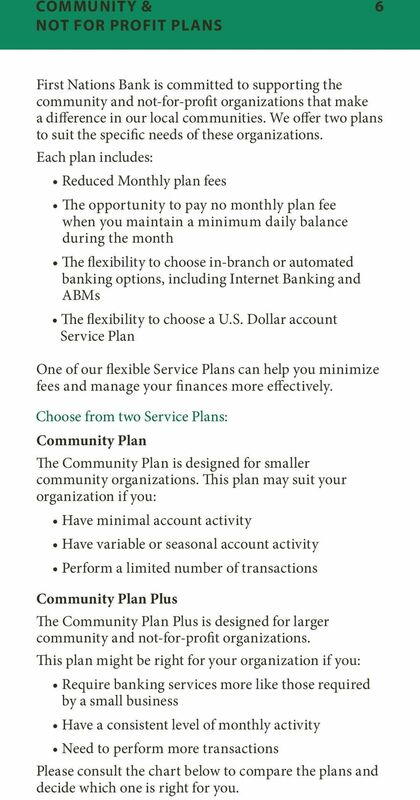 Service Plans For businesses that enjoy the flexibility of banking using both in-branch and automated services Several options depending on your monthly transaction pattern Predictable monthly fee Options Monthly Plan Fee Monthly # of Transactions 1 Included Rebate of Monthly Plan Fee with a Minimum Monthly Balance 2 of Basic $ N/A Plan A $ $20,000 Plan B $ $40,000 Plan C $ $60,000 Plan D $ $100, Additional fee of $1.00 per transaction if number of transactions included in the Plan is exceeded. 2. 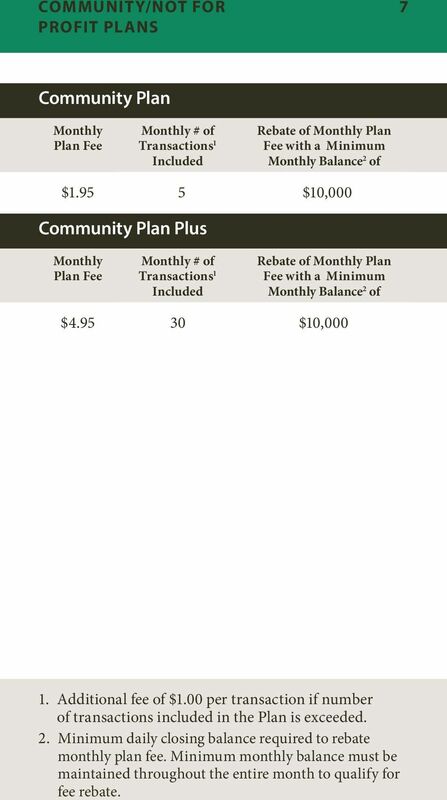 Minimum daily closing balance required to rebate monthly plan fee. Minimum monthly balance must be maintained throughout the entire month to qualify for fee rebate. 6 COMMUNITY & 6 NOT FOR PROFIT PLANS First Nations Bank is committed to supporting the community and not-for-profit organizations that make a difference in our local communities. We offer two plans to suit the specific needs of these organizations. Each plan includes: Reduced Monthly plan fees The opportunity to pay no monthly plan fee when you maintain a minimum daily balance during the month The flexibility to choose in-branch or automated banking options, including Internet Banking and ABMs The flexibility to choose a U.S. Dollar account Service Plan One of our flexible Service Plans can help you minimize fees and manage your finances more effectively. Choose from two Service Plans: Community Plan The Community Plan is designed for smaller community organizations. This plan may suit your organization if you: Have minimal account activity Have variable or seasonal account activity Perform a limited number of transactions Community Plan Plus The Community Plan Plus is designed for larger community and not-for-profit organizations. 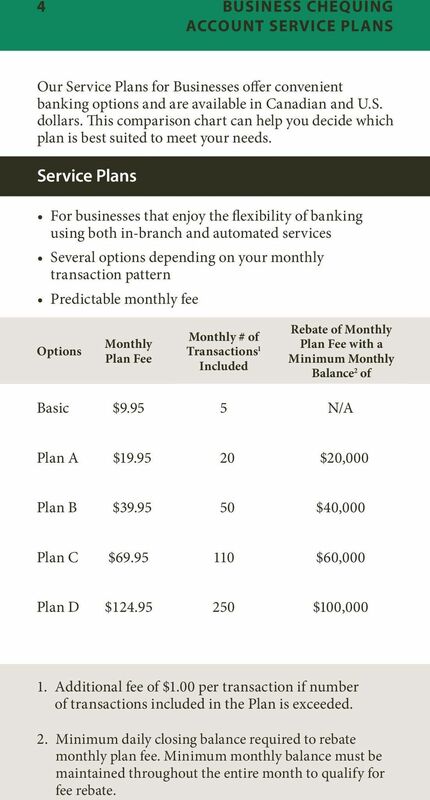 This plan might be right for your organization if you: Require banking services more like those required by a small business Have a consistent level of monthly activity Need to perform more transactions Please consult the chart below to compare the plans and decide which one is right for you. 7 COMMUNITY/NOT FOR 7 PROFIT PLANS Community Plan Monthly Plan Fee Monthly # of Transactions 1 Included Rebate of Monthly Plan Fee with a Minimum Monthly Balance 2 of $ $10,000 Community Plan Plus Monthly Plan Fee Monthly # of Transactions 1 Included Rebate of Monthly Plan Fee with a Minimum Monthly Balance 2 of $ $10, Additional fee of $1.00 per transaction if number of transactions included in the Plan is exceeded. 2. Minimum daily closing balance required to rebate monthly plan fee. Minimum monthly balance must be maintained throughout the entire month to qualify for fee rebate. 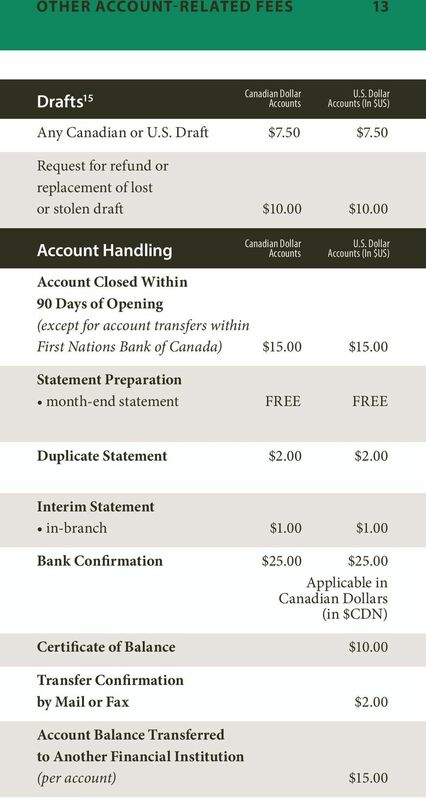 9 FNBC ACCESS CARD 9 First Nations Bank ABM the convenience of 24-hour deposits Withdraw cash, get account balances, transfer funds between accounts and make deposits Worldwide access to cash at over one million ABMs displaying the Interac or Cirrus symbols At branch locations Interac Options the easy way to make purchases Pay for items without having to carry large amounts of cash or write a cheque using Interac Debit Make payments directly from your business account ADDITIONAL PRODUCTS AND SERVICES Business Credit Products When you combine a business account with competitive, convenient borrowing solutions, the result is easy access to the money you need 3 Business Overdraft Protection Business Line of Credit Business Loans Business Mortgages Investment Options At First Nations Bank of Canada, we offer you a wide range of investment options for your hard-earned money. Our family of Term Deposits provides benefits and investment solutions that meet a wide range of needs. Cashable Term Deposits Term Deposits provide you a guaranteed rate of return and flexible interest payments with terms ranging from 30 days to five years. Term Deposits (cashable) may be withdrawn in full, prior to the maturity date. 4 The minimum deposit is $2,000 for short terms and $1,000 for long terms. For more information, speak to your local First Nations Bank of Canada representative. 10 10 ADDITIONAL PRODUCTS AND SERVICES Other services Every business has its unique challenges, and yours is no exception. That s why we offer a full range of additional services designed to help you to compete more effectively. 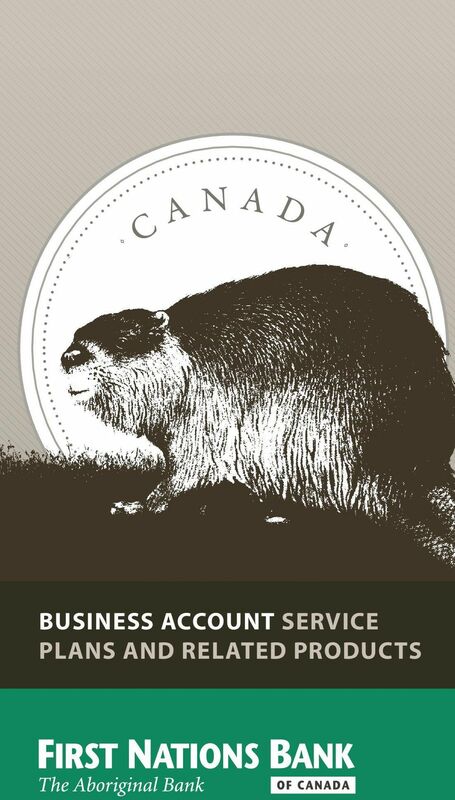 Customer Alternative Deposit Service (CADS) CADS offers commercial clients a convenient funds transfer option in moving Canadian or U.S. dollars from accounts held at other Canadian financial institutions to accounts at First Nations Bank. CADS is provided to clients who do not have a First Nations Bank branch nearby or who wish to maintain arrangements they have already made with another Financial Institution. Transfers are initiated via a Telephone Interactive Voice Response (IVR) system and are credited to the designated First Nations Bank account the next day. Customer Automated Funds Transfer (CAFT) CAFT is our electronic service that can save you time and expense. CAFT provides both credit and debit services for Canadian and U.S. domestic transactions. CAFT credit is great for payroll, pension plan, dividend and investment interest while CAFT debit is associated with collecting and processing your recurring receivables. Payroll Services First Nations Bank in association with Ceridian, is pleased to offer you a complete payroll service package, including tax remittance, reporting and recordkeeping for businesses with as few as one employee. You provide payroll changes for the pay period, and Ceridian will process them and have it ready for distribution within 24 hours. 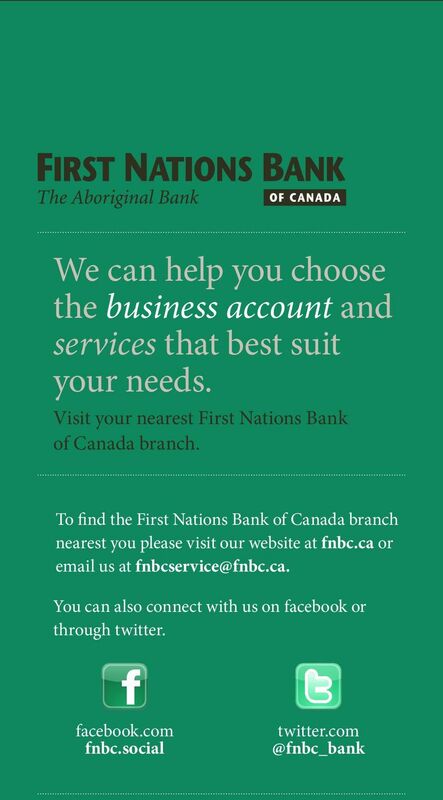 5 First Nations Bank Business Banking If your business has more complex financial needs, a First Nations Bank Commercial Account Manager will take the time to understand your business and then work with you to customize the products and services that meet your deposit, investment, financing, cash management and ongoing financial needs. Ideas and advice can be provided to help your business grow and prosper. Non-Cashable Term Deposits Provides you guaranteed rates of return and flexible interest payments with terms ranging from one to five years. Term Deposits (Non cashable) are not redeemable prior to maturity. The minimum deposit is $500 for long terms. 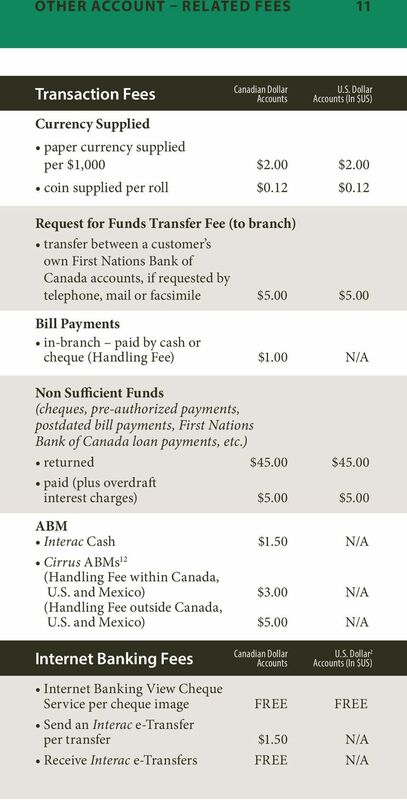 15 OTHER ACCOUNT-RELATED FEES First Nations Bank of Canada means First Nations Bank of Canada, its affiliates and third parties that provide deposit, investment, loan, securities, trust, insurance and other products and services. 2. Maintaining the care, control and confidentiality of your Access Card number, Personal Access Code and Internet Banking password is your responsibility as set out in our customer agreements. 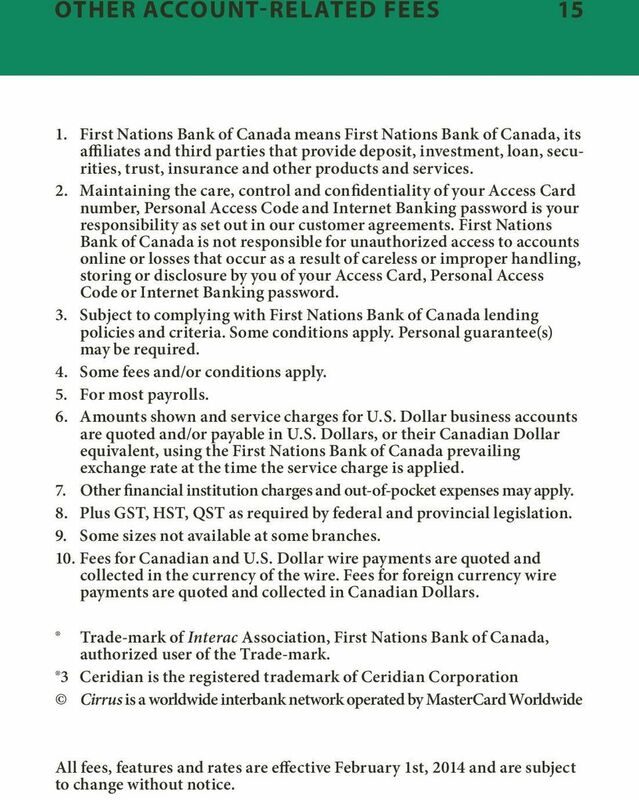 First Nations Bank of Canada is not responsible for unauthorized access to accounts online or losses that occur as a result of careless or improper handling, storing or disclosure by you of your Access Card, Personal Access Code or Internet Banking password. 3. Subject to complying with First Nations Bank of Canada lending policies and criteria. Some conditions apply. Personal guarantee(s) may be required. 4. Some fees and /or conditions apply. 5. For most payrolls. 6. Amounts shown and service charges for U.S. Dollar business accounts are quoted and/or payable in U.S. Dollars, or their Canadian Dollar equivalent, using the First Nations Bank of Canada prevailing exchange rate at the time the service charge is applied. 7. Other financial institution charges and out-of-pocket expenses may apply. 8. Plus GST, HST, QST as required by federal and provincial legislation. 9. Some sizes not available at some branches. 10. Fees for Canadian and U.S. Dollar wire payments are quoted and collected in the currency of the wire. Fees for foreign currency wire payments are quoted and collected in Canadian Dollars. Trade-mark of Interac Association, First Nations Bank of Canada, authorized user of the Trade-mark. 3 Ceridian is the registered trademark of Ceridian Corporation Cirrus is a worldwide interbank network operated by MasterCard Worldwide All fees, features and rates are effective February 1st, 2014 and are subject to change without notice. For more information talk to a CIBC business advisor visit your nearest branch visit cibc.com/businessbanking call 1 800 465-CIBC (2422) 1 If there is no account activity, a statement may not be produced. Commercial Service Charges/ Statement of Disclosure Account Services HSBC BusinessVantage Account Package Interest-bearing chequing account package in Canadian or US dollars that pays tiered interest. Commercial Service Charges/ Statement of Disclosure Account Services HSBC BusinessVantage 2 Account Package Interest-bearing chequing account package in Canadian or US dollars that pays tiered interest. Good news! You may be eligible for these bonus offers Below are your exclusive welcome offers worth up to 85,000 Aeroplan Miles, plus a special small business offer for an additional 30,000 Aeroplan Miles. Interest Checking Earn interest on higher checking balances and pay no monthly service fee as long as minimum balance is maintained. $100. RBC Group Advantage. Banking at work for you. Contact information for account assistance is listed on the last page of this brochure. Please read the following terms and conditions carefully. Thank you for choosing HSBC Bank Canada. About this Statement This Statement of Disclosure gives you information about our service charges. This information supplements the Personal Banking Agreement. High Interest Savings Account (HISA) Business High Interest Savings Account (HISA) Effective May, 200 B2B Bank HISA TM B2B Bank Business HISA TM Interest rates Visit b2bbank.com for current interest rates. ATM Card Application Name Tax ID Date of Birth Address City, State, Zip Phone I wish to access the following accounts with my ATM Card. I understand that only the account I have designated as "primary"
Lending Fees and Charges. Effective from 20 July 2015. Lending Fees & Charges Effective Date: 1 July 2015 All credit fees and charges to any credit facilities regulated by the National Credit Code will be set out in the financial table of your credit contract. Minimum. average monthly balance SGD SGD5,000 SGD5,000 SGD12 SGD3. Note: Eligibility is only for qualif ied ANZ Signature Priority Banking clients.